These Anisette Toasts are light and airy with a subtle crunch on the outside revealing a center with a slight chew. There’s no oil or butter used making these a guiltless pleasure to enjoy for snacking or dunking. 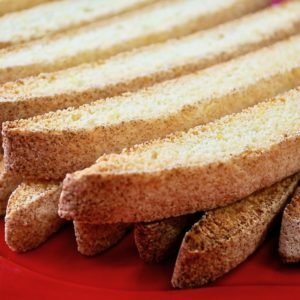 I love all types of biscotti, but these anisette toasts are one of my favorites. 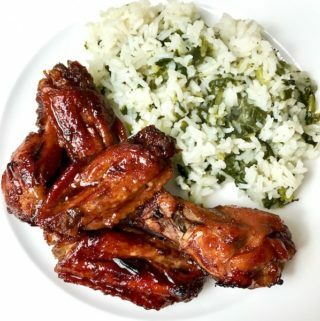 These are simple to make requiring only 7 ingredients. The fragrance of the anise is enticing. The texture of the cookie is crunchy yet soft and chewy. These bring back memories of my childhood and I’m so happy to share them with you. What gives the anisette toasts its light airy texture? Eggs are whipped with the sugar for 5 minutes until they’re lightened in color and form a ribbon when the beater is lifted. Lots of air is incorporated into the eggs and sugar and that is key. A little cornstarch is added to the flour to lighten the texture. By adding the cornstarch, you are basically turning this into cake flour. 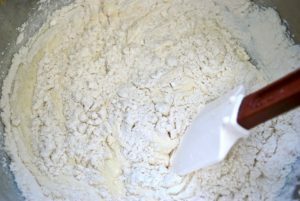 The flour mixture is folded into the whipped eggs and sugar keeping the batter light and airy. Baking these twice is the key to the crunchy texture. 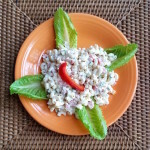 When you take a bite, the ends will be crunchy and towards the center will be slightly chewy. It depends on how long you bake them. 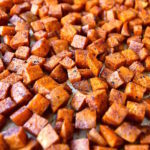 Underbaking a minute or two will result in a chewier texture. 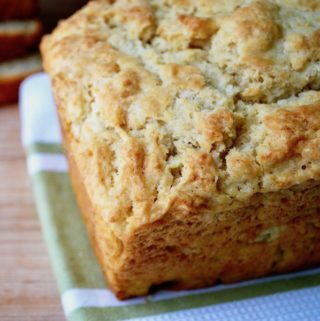 The hardest part about this recipe is pouring the batter onto the baking sheet because the batter is thinner than your basic biscotti dough and spreads quickly. Don’t fret, just pour it on the baking sheet to reach the length of about 12 inches or so. It will spread wide, but that will make beautiful long toasts. Help! My anisette toasts dough spread during baking and looks too thin! 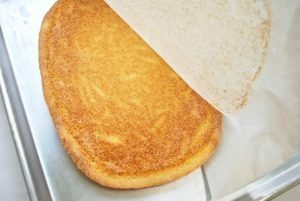 After 20 to 25 minutes of baking, you may see the dough spread thin. Again, don’t fret. It’s just cookie dough. Let it cool for five minutes then peel off the parchment paper from the bottom and place the paper back onto the baking sheet. 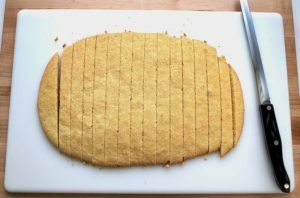 Transfer the baked dough onto a cutting board. Using a serrated knife and a sawing motion, cut into 3/4″ slices. Place slices back onto the baking sheet on middle rack of your oven and bake for 6 – 7 minutes on each side to crisp up. They should be light golden brown. Do I have to bake the anisette toasts a second time? No, you don’t. As I stated above, my family tends to grab these as I slice. These are already cooked and perfectly fine to eat after they’re sliced. They will be soft without the slight crunch (obviously), but they are still delicious! I love the long length of the anisette toasts. They look spectacular and elegant when placed on the tray. 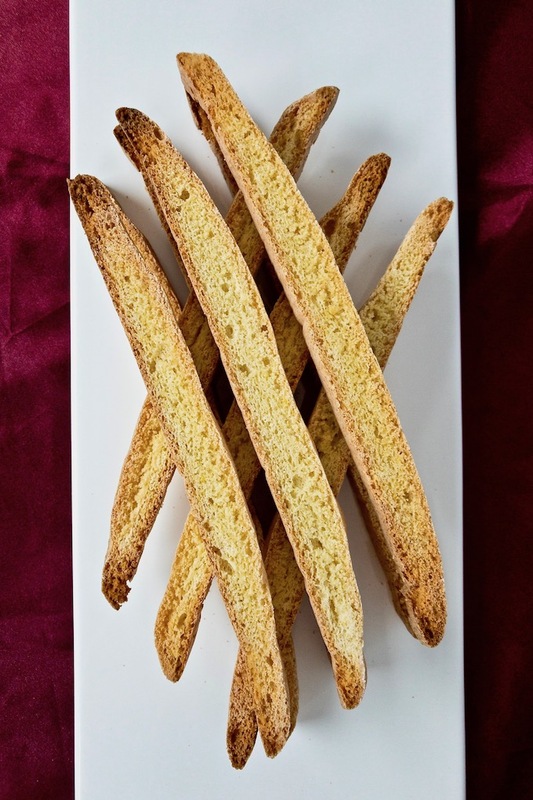 If you want a more consistent outcome, you can use a biscotti pan which will result in a slightly thicker toast. You may have to adjust the baking time by adding a few minutes, but you will end up with anisette toasts consistent in size. These Anisette Toasts are light and airy with a subtle crunch on the outside revealing a center with a slight chew. There's no oil or butter used making these a guiltless pleasure to enjoy for snacking or dunking. Line a baking sheet with parchment paper. 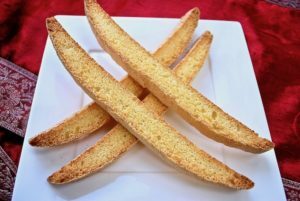 Alternatively, you can use a nonstick biscotti pan. Combine flour, cornstarch, baking powder, and salt in a bowl and set aside. Using a mixer, beat eggs and sugar on high speed for 5 minutes until light and fluffy. Using a spatula, fold in the flour mixture with the egg mixture until combined. Pour batter onto the baking sheet to the length of about 12 inches. The dough will spread but don’t worry. Let cool 5 minutes then peel off parchment from the bottom and transfer the dough onto a cutting board. 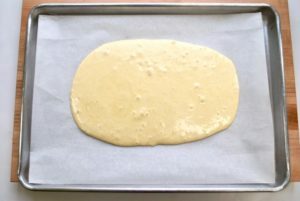 Place parchment paper back onto baking sheet. If you prefer, you can slice each toast in half lengthwise. I find the long toasts to be elegant. 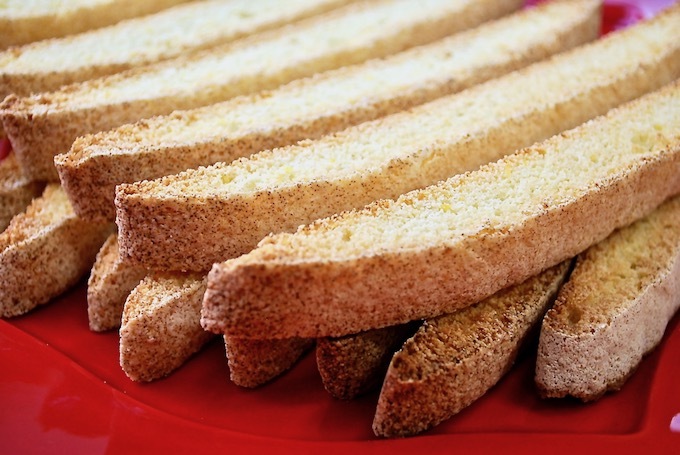 Using a serrated knife, slice biscotti into 3/4" slices and place cut side down back onto baking sheet. Bake for 6 - 7 minutes. Turn them over and bake for another 6 -7 minutes. Let cool and enjoy as is or dunk in your favorite coffee. 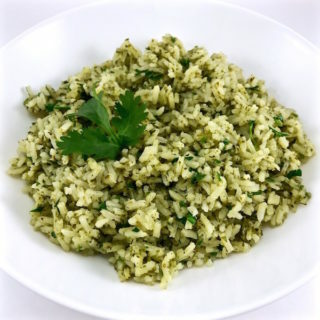 *To quickly bring eggs to room temperature, place the eggs in a bowl with warm water and let it sit for a few minutes. **Can substitute anisette liquor for the extract. The flavor will be subtle but still delicious. 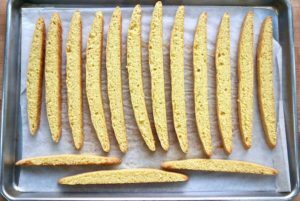 If you use a biscotti pan, you may need to increase the baking time. You will have a slightly thicker toast but the length will be consistent. You can enjoy these after the first baking. 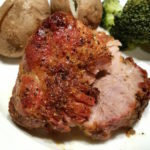 The texture will be soft and spongy and just as delicious.